In May 2015, Stephen Rowles and Luke Waller from Independence Group NL began work at the new Nova Project in Western Australia. Tasked with setting up best of breed systems for the survey department, they worked with Deswik (whose solutions were already in use by the planning team) to extend the Deswik.CAD platform to meet the site’s needs and simplify the typical surveying processes. During the process of working with Deswik to optimize the Nova survey processes, Nova’s surveyors were made aware of an existing reconciliation tool that had been developed for rapidly calculating the overbreak and underbreak compared to designs. Using the powerful and robust Deswik.CAD solids Boolean engine, the tool provides a 3D comparison of the design solids against the survey as-built solids. While the reconciliation tool had predominately been used for analyzing stopes, it was recognized that it would also be extremely powerful for use on analyzing the lateral development during the End Of Month (EOM) process. Following a few modifications to the tool to make it more suitable for reconciling lateral development, Nova started using the tool for their EOM process in January 2016. 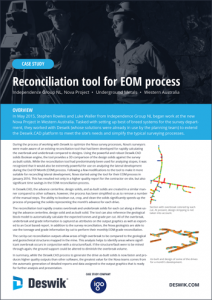 This has resulted not only in a higher quality report for the contractor on site, but also significant time savings in the EOM reconciliation process.